REVERSE SINGLE CROCHET (a/k/a CRAB STITCH) A reverse single crochet is worked from left to right; whereas a regular single crochet stitch is worked from right to left. Insert your hook into the stitch or space indicated, then yarn over and pull up a loop. (You should have two loops on your hook.) Yarn over and draw through both of the loops on your hook. This stitch takes a bit of practice but the outcome is well worth the effort. R2: Ch1, turn. Sc in first sc. (Ch1, sk next sc, sc in next sc) across. Ch30, being careful not to twist the chain, sl st in the first sc on this row. This is the top edge of the tote. R6: Continuous Round: Place marker, sc in ea sc around until the tote measures 8" from top edge. Reposition your marker after each new round. R8: (Sc in next st. Sc2tog) around to last st. Sc in last st.
R9: (Sc in next st. Sc2tog) around. Fasten off leaving a 12" yarn tail for sewing. Using a yarn needle, weave the yarn tail through the last round and draw the opening closed. R1: Join orange with a sc in the first sc to the left of one side of the handle (on the top edge). Sc in ea st along the top edge of the tote and continue around that side of the handle. Join with a sl st.
R2: Ch1, do not turn. Rev sc all the way around. Repeat Trim Rs1&2 on the opposite side. R1: With orange, ch6, sl st in the 6th ch from the hook. (Ch5, sl st in same ch) 4 times. (6sc in next ch-sp. Sl st in main center of flower.) around. 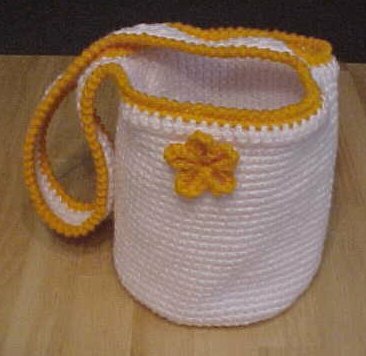 Using a length of orange yarn and a yarn needle, sew the flower on the bag as shown in the photo. You can add more flowers if you want. Flowers in various colors will change the look of the tote.